I spent a long time complaining that Italian whites were boring. I maintained they didn’t taste of anything and if they did they had an unpleasant oily, nutty character to them that didn’t agree with me. However, my attitude to wine is that if I don’t like something, I don’t understand it and I should try more of it. So I persisted with Italian whites and they continued to disappoint me. Until I tried a Roero Arneis one day in a restaurant. And now I am something of poster girl for Arneis. Luckily for me, there is a fair bit being grown in Australia and it’s readily available, even from big chain bottle shops. 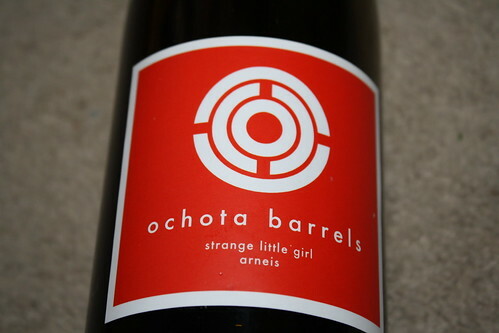 Ochota Barrels is a small, highly regarded Adelaide Hills winery. It’s taken me an age to get around to trying the wines (despite managing to cheerfully recommend them to others – I figure recommending something you want to try is valid) and earlier this year I picked up the Arneis from Belair Fine Wines. I seem to recall that the wine was marked down to $27 (from what, I don’t remember). In the glass the wine was a pale gold colour. The nose was quite pronounced, showing preserved lemon with some honeysuckle and a slight nutty character. In the mouth, there was good and persistent line of acidity, with definite herbal notes: think anise characters like fennel and dill, some marzipan/bitter almond nuttiness that was not too pronounced, and a well balanced mouthfeel. The finish zipped in with some raw, fresh lemon. This was a well balanced and integrated wine and one that I desperately wanted to love (you know – all the hype about finally trying one of these wines), but the leanness and the raw citrus edge just made it fall slightly short of the expectation I’d set. I think the problem here was all about me. The Ochota Barrels website doesn’t list a current vintage Arneis so I’m probably not going to have a chance to revisit this wine. On the one hand, this is a shame, but on the other, it means I’ll just have to keep my eyes open and pick up something else from the same stable. This wine was purchased from Belair Fine Wines for $27.